How many times have you dumped your Android device because the battery got drained? The frustration that it brings is absolutely unimaginable. 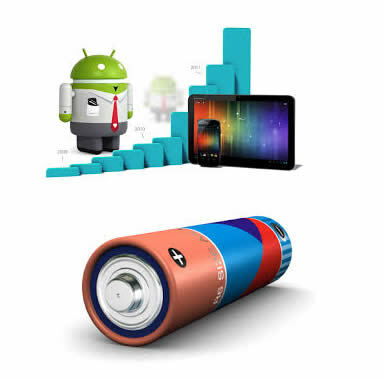 But here is the deal, these 15 steps will greatly increase and improve your Andriod battery life. By default, alot of services runs on our Android device but we are too busy to take note. Turn-off your Wi-Fi if you have no use for it. Wi-Fi consumes alot of battery life, you would be amazed how many more hours you can rack up once the Wi-Fi service is turned off. Just like the Wi-Fi, the network band you set your Android device on plays a vita role in determining how many hours your device can last. 3G and 4G network consume so much resources and power, it is best practice to enable 2G network when you are not downloading or using a app that requires high network resources. Setting your screen brightness to a reduced level will greatly enhance your Android device battery life. GPS is a battery predator, it consumes lots of battery life just like Wi-Fi and/or 3G/4G network. Disable this feature if do not make use of it. It is best practice to charge your battery only when your device is left with a minimum of 20% battery. Charge up to 100% and unplug device. While you are charging your Android device, try to take off the case of your Android device. This is to prevent heat, temperature above 45 degrees isn’t good for your device. You can also conserve your Android device by reducing the timeout of your screen. One minute screen timeout should work like a charm. Many of the Apps you close do not exit automatically, they run in your device background. This also consumes battery power. Keep in mind that no app is running in your background. Every android device comes with this power control widget, if it’s already in your homescreen, then it’s okay. Otherwise long press on your desktop and select the widget and scroll till you didn’t get the power control widget. Do you really need that vibration? If you do, you have to choose between vibration and battery life. Only turn on vibration when the condition is right. Maybe in a situation where you don’t want sound from ringtones and notification to become a bore to the guys around you. Turn on Airplane mode if you are traveling. This also reduces battery consumption. Homescreen widgets also eat up lots of battery power, so make sure to use only those widgets which are necessary. Auto Sync is used for Google real time synchronization such as Gmail, Google Contacts, etc. If you do not need this feature, do your battery a favor by turning-off the feature. Juice defender is one Android app I love, this app is specially designed to help user with lower battery consumption and squeeze more power out of their devices’ batteries. That’s it, if you can perform 14 of the 15 Ways To Improve Your Android Battery Life, you would definitely notice an improved battery life. Who Needs BBM Service On Android And iOS? Hello Nosa. A great tips shared by you. This really helps me to improve the battery life of my smart phone. Love to read more articles about the android phone. Hey Nosa, You have a Wonderful Blog and have a Interesting tips. i enjoyed your post very much reading it and Thanks for posting such a nice post. You can also use a plain wallpaper than the “live” one. It consumes lots of battery life. this best way to never go down your battry..